Richard Clarke was back at Palm Tree Lagoon and it wasn't long before he smashed his rohgu pb with a 30lb specimen and then went on to also beat his crystal eyed catfish pb, and followed that up with an awesome giraffe catfish a new species for him. 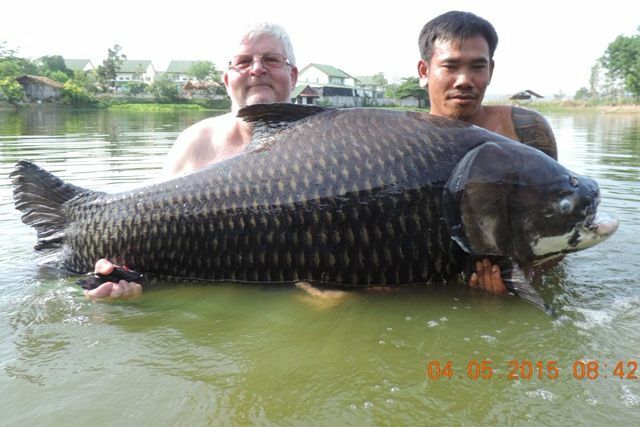 But what he has really after was a big Siamese carp which came on his second day when he caught one that weighed in at a staggering 75.4kg 166lb joining the Palm Tree Lagoon 150lb Carp Club in the process. He also caught more Siamese carp, a mrigal carp and freshwater stingray which were both new species for him as well as a number of Amazon redtailed catfish. Tap of Bangkok Fishing Guide Service returned with his customer Cristofre Martin who last time he came caught an awesome 68kg chao phraya. 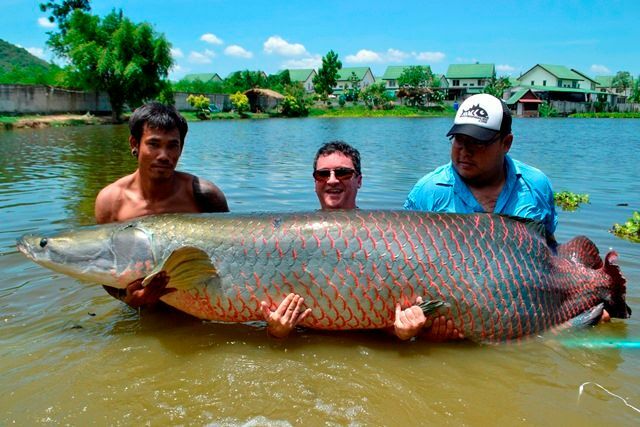 This time was no different after a slow start he hooked into one of the Palm Tree big girls and after battling for nearly an hour successfully landed a 400lb+ arapaima qualifying for a Palm Tree Lagoon 400lb Arapaima Club t-shirt. 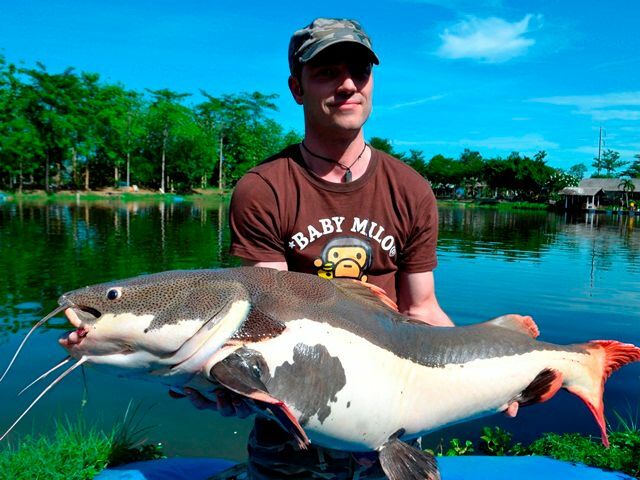 He also caught wallago attu, Amazon redtal, striped catfish and chao phraya catfish. 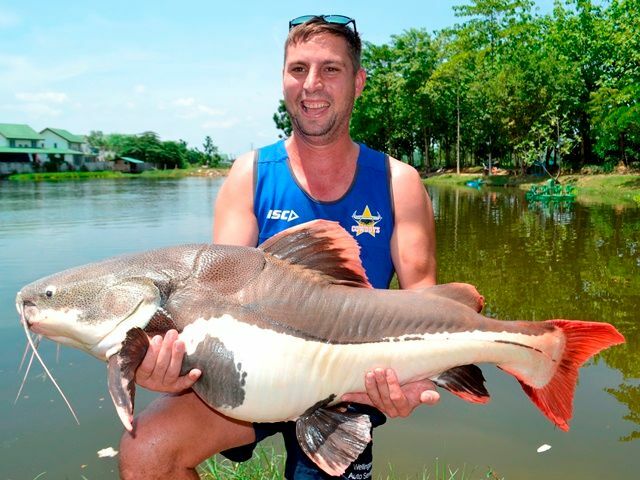 Australian angler Adam James returned for his second visit during the month and finally ended up the victor after a four hour battle with a 300lb+ mekong catfish and in the process joined the ever expanding Palm Tree Lagoon 300lb Catfish Club. 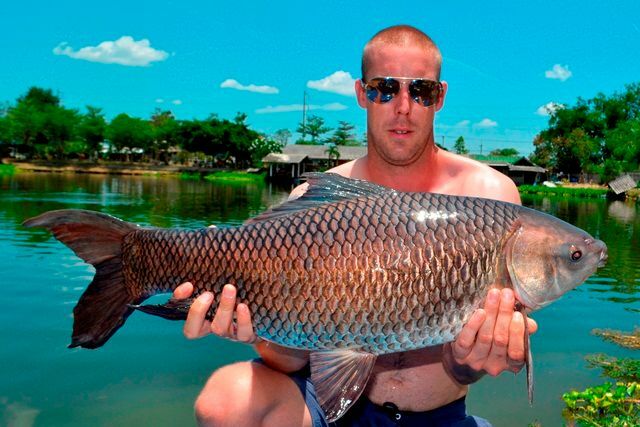 He also caught many other impressive fish that included Siamese carp, rarely caught Chinese silver carp and small scale mud carp, mrigal, rohu, wallago attu, ripsaw catfish, and numerous Amazon and Thai redtailed catfish. 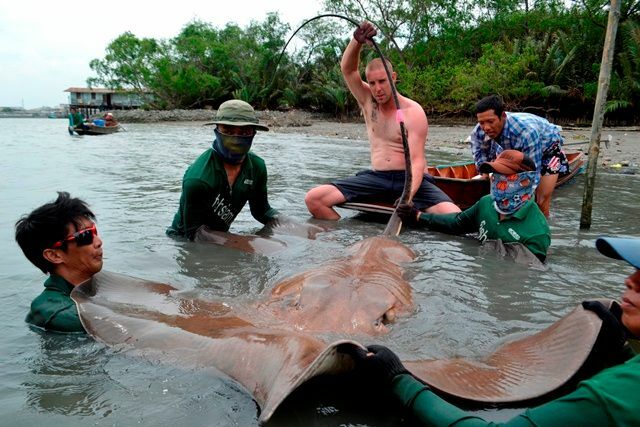 Eddie Brook went down to the Mae Klong river with Tim to try his hand at stingray fishing. After a few stolen and crushed hook baits Tim landed a small stingray and with the tide started to run out fast the team moved downstream towards the river mouth looking for slower water. It wasn't long before Eddie was into a monster ray and after battling for 2 hours started to realise he was not as fit as he thought. Eventually the stingray succumbed and was measured at 1.95m across.Whilst this was going on two more baits were taken which resulted in two more stingray being caught another good sized one of 1.74m and a smaller one to finish off what was certainly a red letter day on the river. 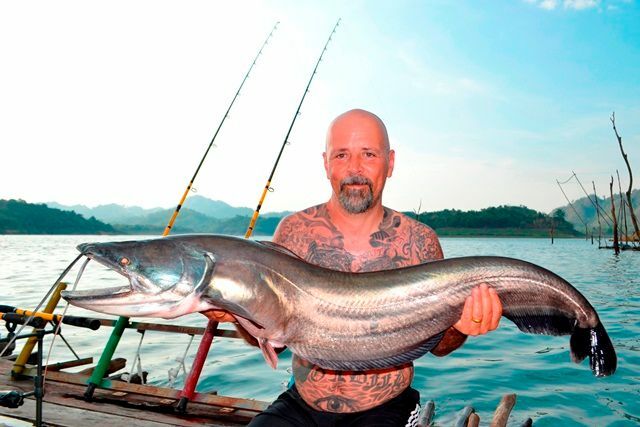 Richard Clarke headed up to Khao Laem Dam with Tim for his inaugurate visit with the goal of catching a wild wallago attu and a wild giant snakehead. 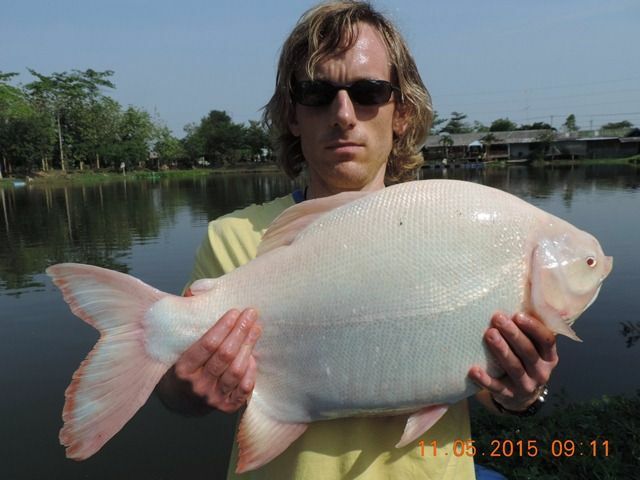 He easily achieved both targets catching giant snakehead to 4.5kg and wallago attu to 12kg. They also experienced some wild weather in the process having to batten down the hatches and sit it out. 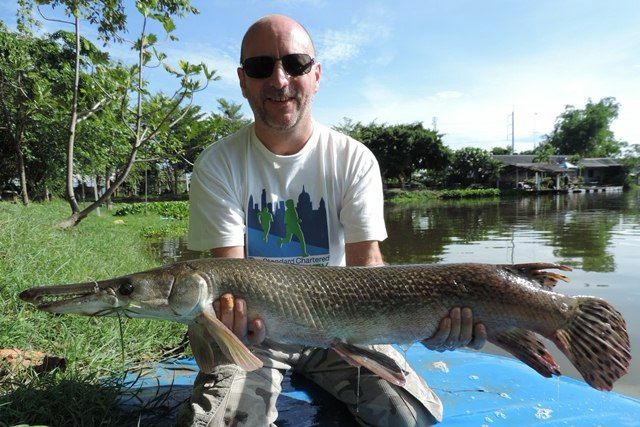 Gary Munro made his long awaited first visit and had a ball catching a wide variety of fabulous catches that included an awesome giraffe catfish, wallago attu, mrigal, alligator gar, striped catfish, mekong catfish, rohu and a number of Asian and Amazon redtailed catfish. 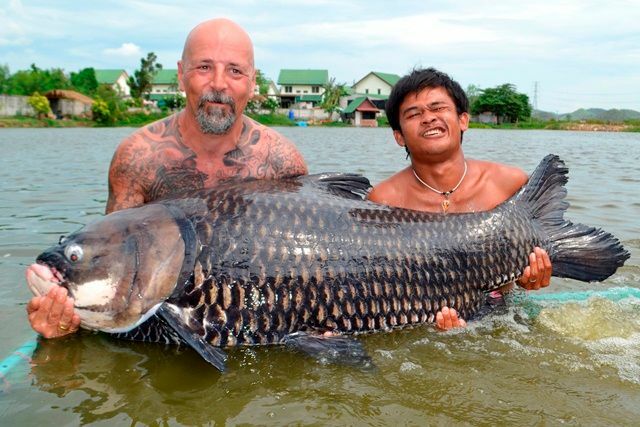 His main target was to catch a 100lb+ Siamese carp and although he hooked one he unfortunately lost it after a gruelling one hour battle. 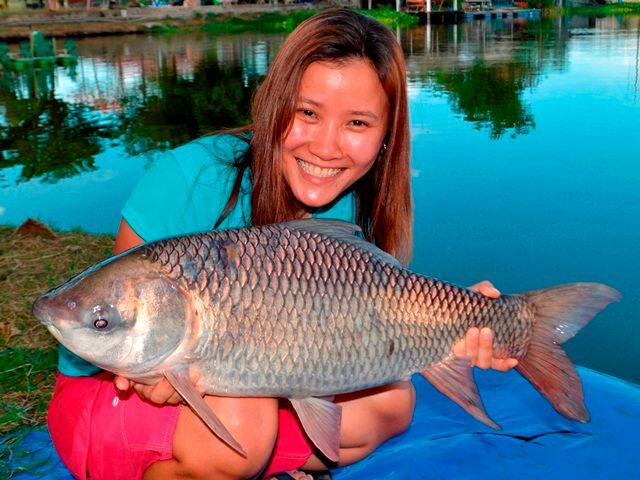 Kaye Choi made her first visit to Palm Tree with a group of angling friends. 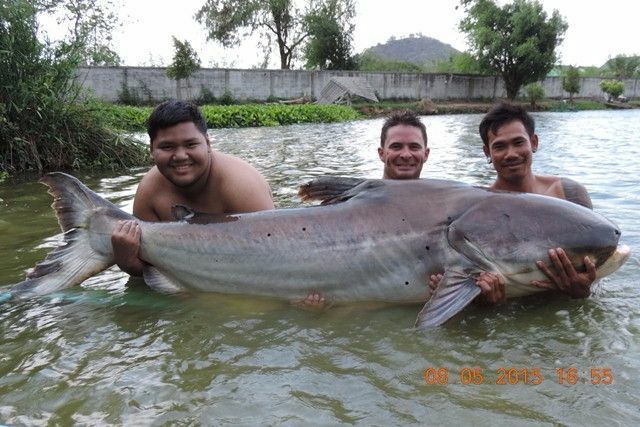 They caught a number of stunning fish which included a rare albino chao phraya catfish, Siamese carp, mekong catfish, black ear catfish, Amazon redtail catfish and rohu. 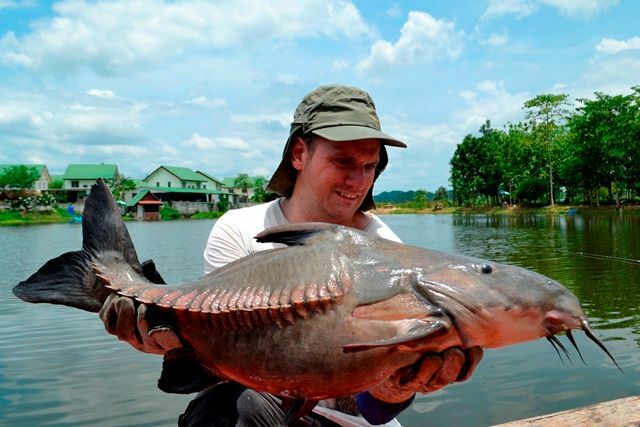 Eddie Brook returned after an absence of more than year and was soon back into the swing of things catching a number of great catches such as tambaqui, wallago attu, rohu, mekong catfish and Amazon redtailed catfish. Bad Boy sent down a group fo Singaporean anglers for a visit. They caught a variety of species that include a stunning mrigal carp, rohu, tambaqui, striped catfish, pacu and Amazon redtailed catfish. 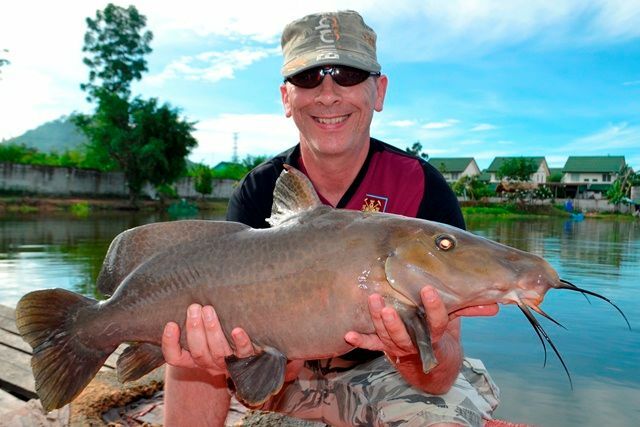 Bangkok resident Rick made his first trip to Palm Tree during the month catching some cracking fish such as ripsaw catfish, black shark minnow, an awesome albino chao phraya catfish, rohu as well as both Amazon and Thai redtailed catfish. Australian angler Andy Adams made a fleeting appearance at Palm Tree but still managed to catch some nice fish which included tambaqui, rohu and both Thai and Amazon redtailed catfish. Richard Mapley caught an awesome albino pacu as well as a number of Amazon and Thai redtailed catfish on his first visit to Palm Tree. 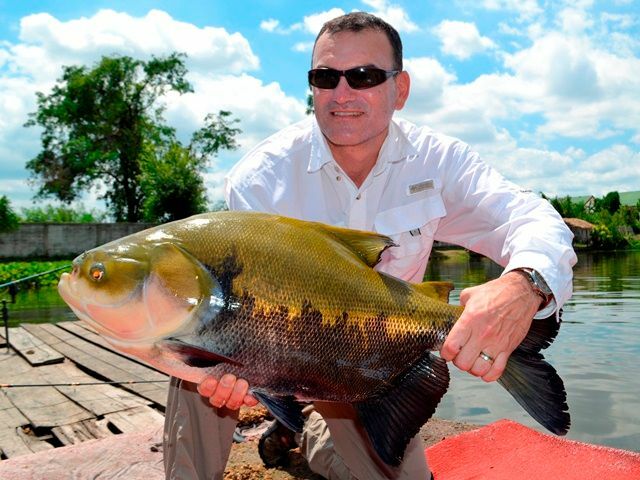 Richard Clarke went along with Tim to the River Kwai Noi on a quest to catch a wild goonch on a lure. He did manage to catch one albeit a small one but this was more than made up for by the fact that the rarely caught Thai mahseer were on the munch. He also caught what was another new species for him the very shy tinfoil barb. 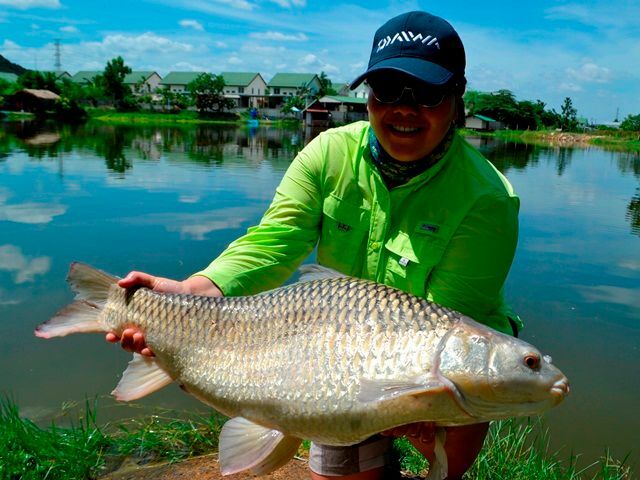 Tap of Bankgkok Fishing Guide Service brought down his first customer for the month who successfully caught a number of Asian and Amazon redtails and tambaqui. 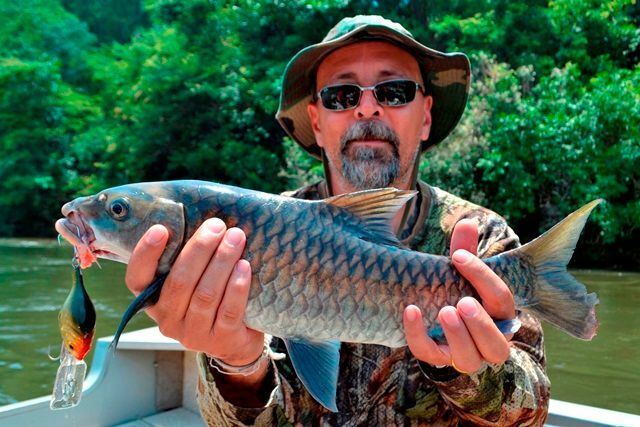 Gary Smock and Gavin Rogers both managed to catch chao phraya catfish as well as rohu and alligator gar. 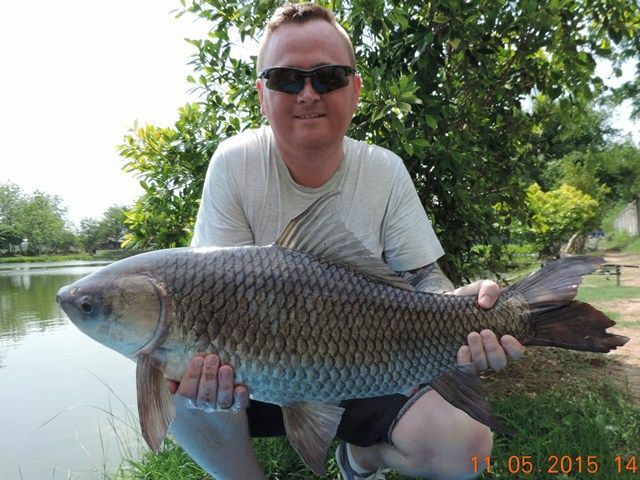 Ian White came for his first visit to Palm Tree with his fishing mate and managed to catch a number of Siamese carp and Amazon redtailed catfish. 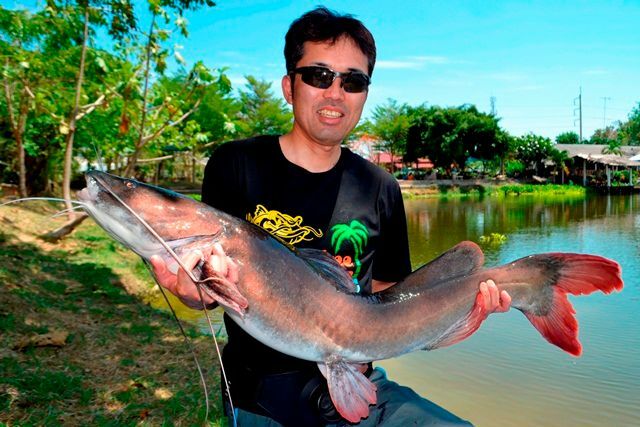 One of our returning Japanese clients was certainly getting into the Amazon and Thai redtailed catfish.